Drumming, Culinary Arts, Marketing and Entrepreneurial Opportunities, Hockey and Curling, Parlor Games, Chess, Tattoos. The problem with a a Bobby Ryan trade is that he has a NMC and would require protecting at the expansion draft. Otherwise a trade could make sense. Bobby Ryan is a year younger and I think still has some offense to contribute that Ericksson seems to be lacking, plus if the trade is done after signing bonuses Ericksson makes a lot less than Bobby meaning Ottawa would have to give up some nice assets to take on a less expensive contract (sharks 1st in 2020? 2 of their 3 2nd rounders?) Really though, I think Ericksson is here to stay for at least one more season, I just don't see GMJB having the gusto to make a move of this sort. I have faith in him in a lot of ways but trading a bad contract like Loui's might just be too difficult to orchestrate. He isn't going anywhere, and I see no situation where our GM and Petey have contract issues with the cap space and ending contracts we will have. Wasn't really choice per say - was just looking at options of who we could ship out as a cap dump. Obviously I'd prefer if this was an option they make it Ericksson part of this deal and move Sutter seperately. Depending on where they fall: Canucks: Both NYR late 1st round picks NYR 2nd round pick NYR: 10th OA Ericksson or Sutter All of a sudden we have 4 picks in the top 40 and move a bad contract. If he truly is Day-to-Day I really hope they don't play him, that said down 0-1 in a best of 3 they will be desperate and I expect to see him on the ice today. Regardless, when he is out sign him but make sure he's healed before he plays a game.Hell, rest him until we have 10 or less games left in the season. I believe you are correct on both fronts. Surprised they didn't paper down at least Sautner and Schenn. Essentially this makes Sautner and Schenn our #7 and 8 for the remainder of the season. If I'm not mistaken Sautner wasn't papered down yesterday meaning he isn't eligible for AHL playoffs. Same goes for Gaudette and Demko. We were only rocking 6 D on the roster with Guddy moved, smart move to at least have some insurance in case of an injury. Edler likely not ready to come back yet. Will be interesting to see who sits when Baer, Virtanen, and Pearson are all here and healthy. 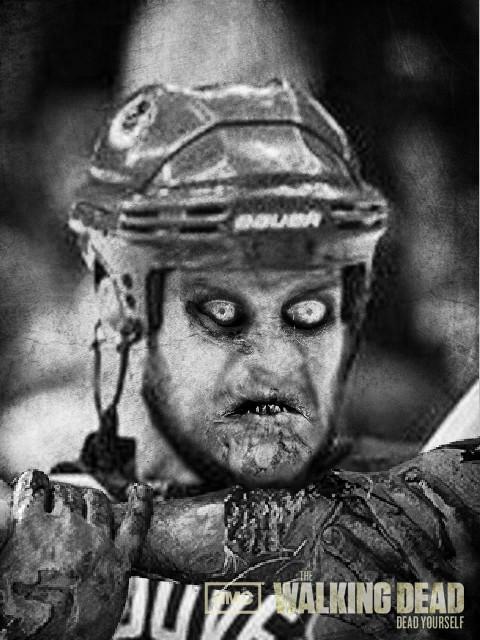 Have been trying to figure out a zombie themed name for weeks and just realized it tied perfectly with my favourite player, bwahaha zombieksa! Zomballard, Zombooth, TheWalkingDedler, BurrainEater,... There, took me a couple seconds. Great name and great picture. Got mentioned in a CanucksArmy post today. Sort of got called sketchy. Proud and insulted I guess. Don't worry brosephine, no one takes blogs seriously anyway. Pokerstars CDC Game Room, PM for details.